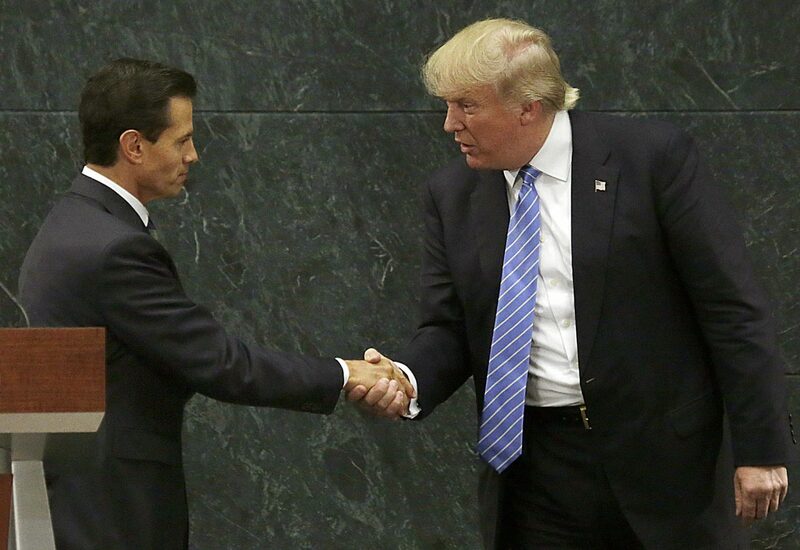 Mexico's President Enrique Pena Nieto and Republican presidential nominee Donald Trump shake hands Aug. 31. The Republican presidential nominee said after meeting with Pena Nieto that the pair had a substantive, direct and constructive exchange of ideas. VAIL — Vail mayor Dave Chapin is alarmed by the ongoing anti-Mexico rhetoric in the U.S. presidential campaign aimed at a nation that accounts for 10 percent of the visits to America’s most popular ski resort. Chapin said 15 percent of Vail’s economy is based on international tourism, with 10 percent of those guests originating in Mexico, and Vail recently re-upped its sister-city relationship with the artist and resort community of San Miguel de Allende, 170 miles northwest of Mexico City. Vail is the busiest ski area in the country, with 1.6 million skier days a season — meaning more than 150,000 of them are Mexican skier days. The town of Vail and Vail Resorts both actively market the Vail Valley in Mexico City, and Mexican families have been buying real estate in Vail since the 1960s. Mexico is also the second largest trading partner for Colorado as whole, importing nearly $1 billion in goods a year and accounting for more than 105,000 Colorado jobs, according to the U.S. Chamber of Commerce. Visits to Colorado from Mexico have surged from 104,178 in 2009 to 175,301 last year, according to Tourism Economics. Chapin is worried those numbers could all start dropping if Trump continues his talk of mass deportations and making Mexico pay for a border wall. Chapin said any reform must take into account Vail’s dependence on an immigrant workforce from Mexico — a workforce feeling increasingly threatened by Trump’s rhetoric. Besides of its focus on halting illegal immigration, the Trump campaign is also targeting legal immigration. Despite his visit to Mexico City last week to meet with Mexican President Enrique Pena Nieto, Trump is not backing down on his promise to build a 2,000-mile-long border wall and make Mexico pay for it. In a speech in Arizona on Wednesday, he clarified but continued the calls for mass deportations that helped land him a GOP primary win. But Floyd Trujillo, a Denver-area businessman helping to spearhead Hispanics for Trump in Colorado, said that Trump’s role as a maverick and his willingness to speak his mind make him the ideal GOP candidate. Trujillo thinks Trump will continue to refine his immigration policy. “Donald Trump, not being a polished politician — and again, I support him; we all stumble — but if you ask about how he’s going to change things, I’ll make a bet with you that you’ll be surprised by what he comes out with on his immigration policy,” Trujillo said. Trujillo added that areas reliant on legal Mexican tourism and real estate purchases like Vail have nothing to worry about, but illegal immigration to provide cheap labor needs to stop. However, a spokeswoman for Democratic presidential candidate Hillary Clinton disagrees with Trujillo about the potential damage to Vail’s tourism connection to Mexico. State Sen. Ray Scott, a Grand Junction Republican who’s the Western Colorado field coordinator for the Trump-Pence campaign, said Trump’s message is resonating with working-class Coloradans on the Western Slope because of his business acumen and his focus on bringing back good-paying jobs for American citizens. David O. Williams is a longtime freelance writer based in the Vail Valley. He co-owns and edits RealVail.com and RockyMountainPost.com.